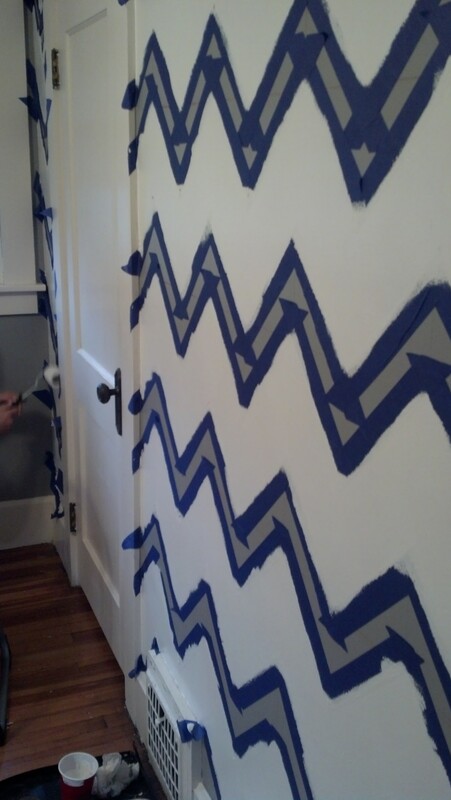 The Official Guide to Painting a Chevron Wall // In 6 Simple Steps! Did you just get home after a long day of work and have 20 minutes to kill? If you answered yes, you should probably stop because this is not a good idea for you. Otherwise, go on. Did you just get a new place or are you in the mood to redecorate? If the answer is yes, keep reading. 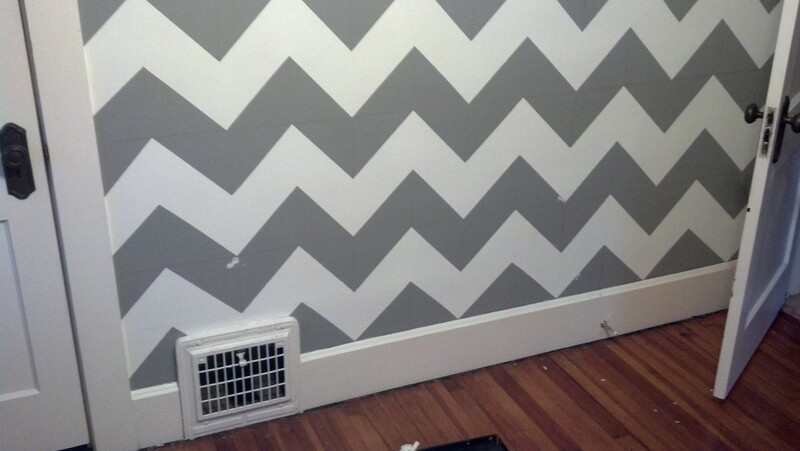 I have envisioned a gray & white chevron nursery for months – I think even before I got pregnant. I mentioned it to my husband who, rather than flip out on me, embraced the idea. And we then quickly recruited my bestie’s graphic designer husband to help (this is a wise choice). Yesterday, they tasked themselves to this while we shopped for nursery decor. They photo-chronicled the process so that you can recreate. 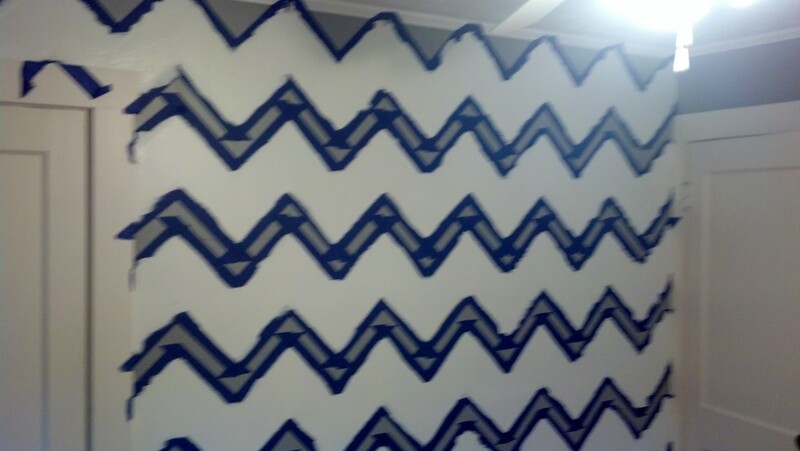 Step 1: Paint the wall one of the two colors you intend in your chevron and let it completely dry (this may take 2 coats). 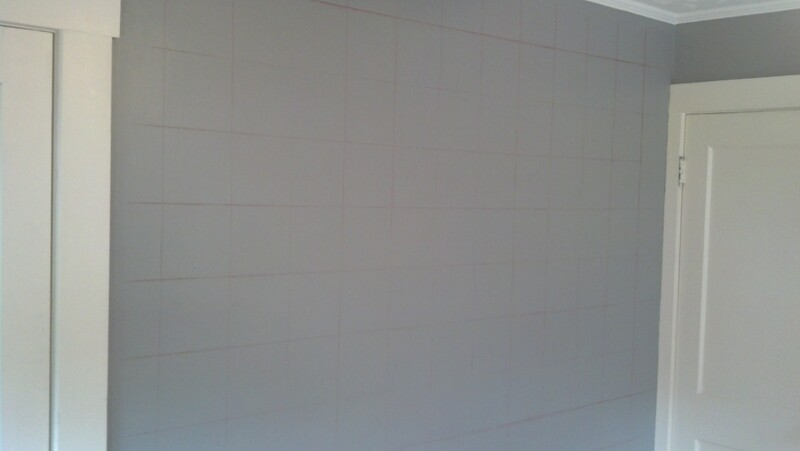 Step 2: Grid off your wall using chalk. Your grid should be the exact width you want your lines to be – I wanted 7 inch lines, so they made 7 inch boxes. 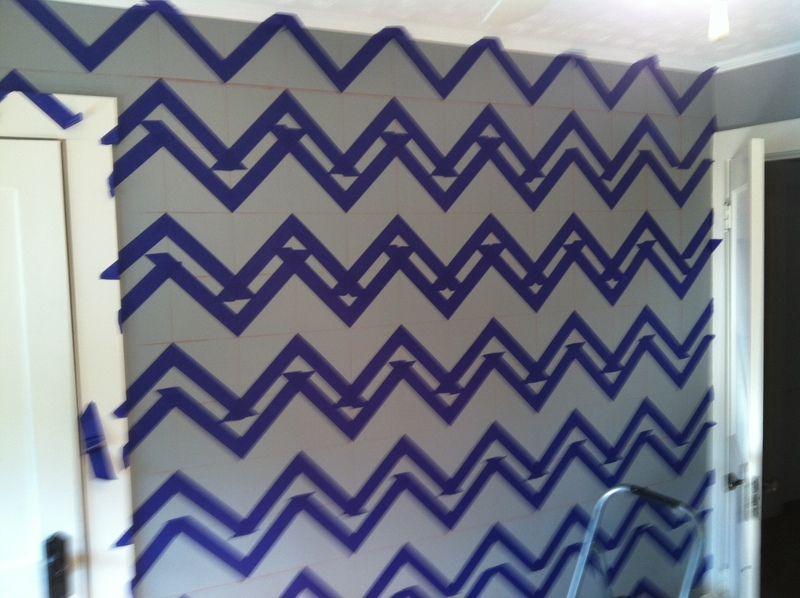 Step 3: Cut painter’s tape to approximately the lengths you want, at a 45 degree angle and apply to grid. You place the tape corner to corner, staying outside the boundaries of the new color. 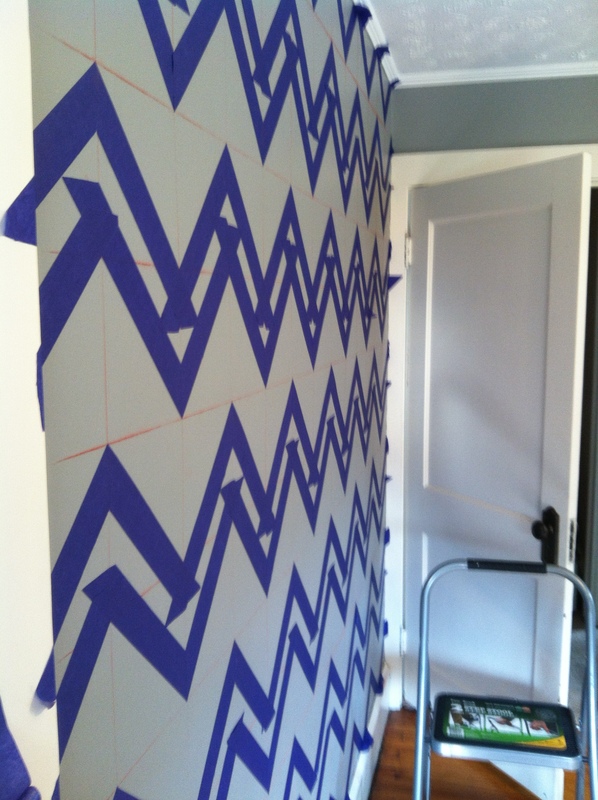 Step 5: Remove painter’s tape before it is completely dry, so as to not flake the chevron, and touch up as needed. Step 6: Bask in your awesomeness while you allow the paint to fully dry and then come back in a day or two and wash the grid off the wall with a soft cloth and lightly soapy water. Enjoy it while it dries – you just did something awesome! Then in a day or two, wash off the chalk grid with a soft cloth and soapy water. HUGE thanks to my incredible husband and our friend Steve on this one – I am so thrilled that this is the room where we will welcome our baby girl home! 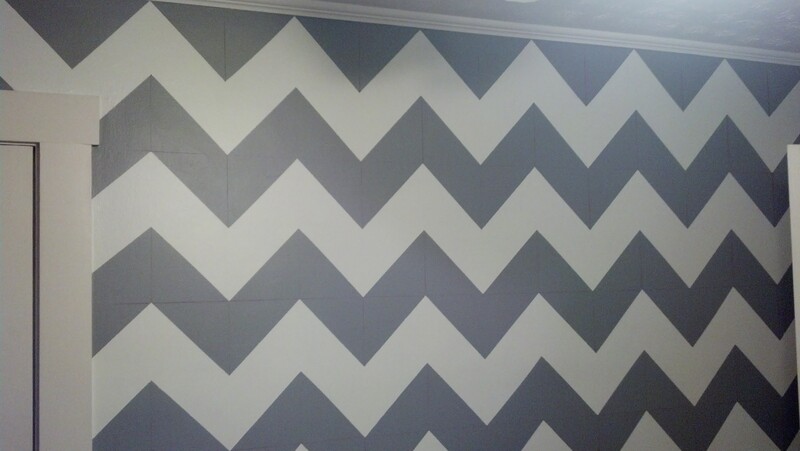 Colleen & Mike – the nursery looks AWESOME! It’s no doubt Baby Cook is going to be a fantastic human being (it’s in the genes) – and she’s going to have a fantastic room to match. Excited for you two! OMG – in love with this. I am definitely stealing this idea for my guest room this summer. I want to live in Baby Cook’s room!